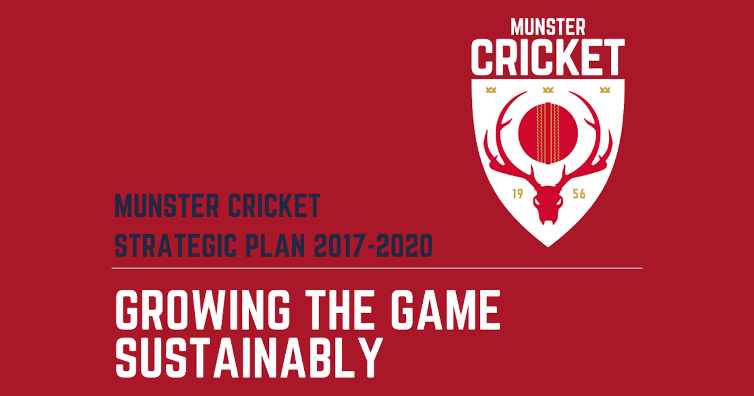 Munster Cricket is delighted to launch its Strategic Plan for the development of cricket in Munster over the period from 2017 to 2020. In an exciting and challenging time for Irish Cricket overall, the aim of this Plan is to grow cricket on a sustainable basis throughout Munster and to support the Munster affiliated clubs and their members to achieve their potential as cricket grows as a sport throughout this area and in Ireland as a whole. The Plan clearly identifies the challenges which must be dealt with to grow the game successfully and sustainably and sets out the actions required across nine key areas which Munster Cricket needs to progress in the period from now up to 2020 and beyond. Significant resources need to be identified and put in place in order to achieve the aims set out in the Plan and Munster Cricket looks forward to working in close co-operation with its member clubs, it’s fellow Provincial Union’s in Ireland and with Cricket Ireland to generate the necessary resources and put effective actions in place to achieve the aims of the Plan. Putting appropriate management resources in place to enable us implement key Plan actions, run the Union’s affairs effectively, develop commercial partnerships and enable us to react positively and proactively to the fast changing landscape in Irish Cricket following the achievement of Full Membership status earlier this year. Munster Cricket would like to thank all those who contributed to the process of putting this plan together. In particular, we would acknowledge the contributions of our Regional Development Officer, Jim Doran, and of Tim Simmonite who acted as our external consultant during the preparation phase. Putting a plan together is one part of the process. The real challenge is to implement it effectively and Munster Cricket is ready and willing to take on that challenge.